The misery index in North Africa on Thursday. Heat waves have unfortunately been very on trend this year. Following sweltering temperatures in the northeastern U.S. and a ridiculously hot, smoky Siberia, we have what may be the hottest temperature ever recorded in Africa. Weather reports from Ouargla, a city of 190,000 in Algeria, indicate the mercury cracked 51.3 degrees Celsius (123.4 degrees Fahrenheit) on Thursday. That looks to be the highest reliable temperature record recorded in any month for all of Africa. The soul-melting high heat mark was first noted by meteorologist Maximiliano Herrera. Since then, other meteorologists have had a chance to weigh in about the temperature and how it stacks up to past measurements. We know that the northern tier of Africa has been blanketed in heat this week courtesy of high pressure that’s kept stifling air in place. The same phenomenon has been at play in other intense heat episodes around the globe this year, including the recent warmth in the U.S. and Siberia. 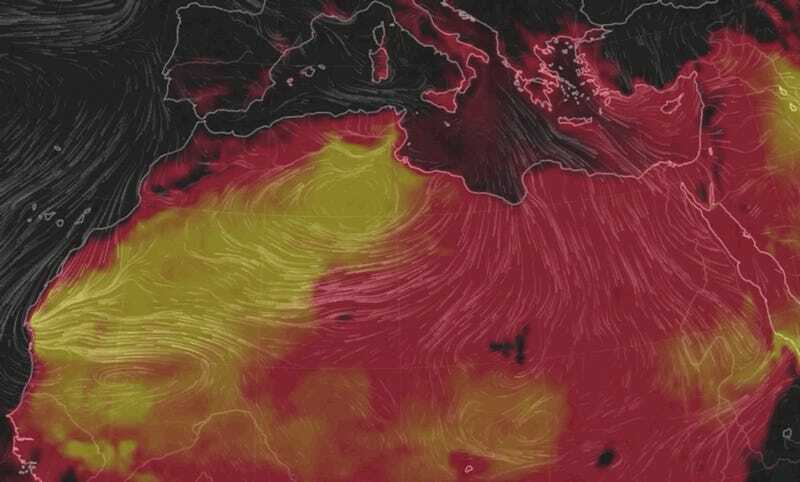 The heat dome over Algeria and the rest of North Africa was particularly intense, though. In statistics parlance, it was “3.5 to 4 standard deviations from normal, meaning it was highly unusual” according to Capital Weather Gang meteorologist Jason Samenow. So conditions on the ground and in the atmosphere seem to indicate the area was primed for record-setting heat. There is a disconnect between many of the old (pre-1950) French and Italian colonial temperature records from many African weather stations versus the modern records at these same sites. Kebili is one of those. Between 1920-1933, Kebili reported 50-55°C maximum temperatures almost every summer. But since 2000 its absolute maximum has been only 48.5°C (119.3°F). The older recordings by colonial stations involved thermometers and shelters that probably would not be accepted today. Furthermore, the modern records from this site do not support the possibility of such a high reading. This type of circumstantial evidence has been used to overturn records in the past. Al Azizia, Libya once held the world record for the hottest temperature ever recorded, but the World Meteorological Organization (which is in charge of records) took the title away in 2012 after a years-long investigation into record keeping methods, comparing it to the modern record as well as past records in the vicinity, and other forms of forensics. If you like a good weather record thriller (and who doesn’t), the whole report is actually a great weekend beach read. The Kebili record could now come under similar scrutiny thanks to the new challenger that has emerged. WMO would also, of course, have to certify the reading in Ouargla. Is this heat wave a symptom of climate change? Heat waves have happened in the past, and some tough guy jabronis might pull out the ol’ “where was climate change back then” talk. But numerous studies have shown that climate change plays a role in amplifying them and making them more common. Don’t listen to the jabronis.